After a record breaking 2018, what does 2019 hold for the Port of Galveston? Please join the Galveston Hotel & Lodging Association on Tuesday, April 16th for lunch and a presentation by Rodger Rees, Port Director/Chief Executive Officer for the Port of Galveston. Mr. Rees will also give a brief overview of the Port's Strategic Master Plan. 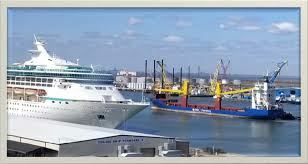 The plan outlines the port’s long-term goals for cruise travel, cargo shipping, and commercial development. The Port of Galveston announced that it achieved a new milestone in 2018, with over 1.96 million passengers passing through, surpassing previous passenger volumes and setting a record high as the busiest year since the port began its cruise business in 2000. The 268 cruise ship calls record broke the previous record of 255 turnarounds set in 2017, a 5.1 percent increase.